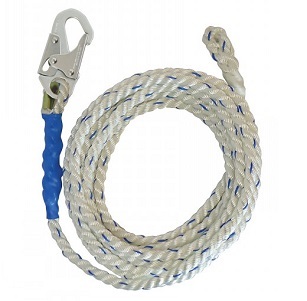 Falltech #8150, 5/8 inch X 50 foot Vertical Lifeline Polyester Rope, with Self-Locking Snap Hook at one end and a Braided End at other. OSHA 1926 and ANSI Z359.2007 Compliant. Price/Each. The FallTech 3-Strand Vertical Lifeline with Snap Hook and Braided End is made of 5/8 inch premium polyester rope. It has 1 snap hook end and 1 braid-end and is abrasion, UV, and chemical resistant for long life. The 3-strand construction provides low elongation and durability. Meets the Requirements of OSHA 1926 and ANSI Z359.2007. Protective PVC shrink tubing protects splice area. 5/8" Polyester has 8500 Lb strength, Mininum 5600 lb tensile stregth, 310 lb Max Capacity.